When I was but a lad, my aunt introduced me to a little card game called Magic: The Gathering. And down that rabbit hole I went. Magic’s not perfect (and I haven’t purchased a card in years, at this point), but it certainly has provided me with years of entertainment and is a go-to game for some of the people I play games with to this day. For years I have been trying one online TCG after another (or collectable card game, as some of them prefer to be called, since not all feature trading), but have been unable to find a fix worth replacing my Magic addiction with. So when I saw the announcements about Scrolls from the makers of Minecraft, I was highly intrigued. A game that isn’t pay-to-win? Tactical board game elements? Cards that transform into little animated characters? Sign me up! Scrolls is now available for purchase in “public beta” form (whatever that means; frankly, once you start charging money you are providing a product no matter what you call it), and I have been playing it for the past few days to see if it will scratch my CCG itch. Unfortunately, the short answer is “probably not so much.” While Scrolls is interesting, there are a number of flaws that are embedded deeply enough in the core gameplay that no amount of beta tweaking is likely to fix them. When you first launch Scrolls (after purchasing it), you will find yourself facing a choice in which starter deck to begin the game with. The choices are growth (lots of creatures), energy (machines and direct damage), or order (fewer creatures, more buffs). I chose growth, because who doesn’t like hordes of beasties? Unfortunately, the growth starter deck at least is terrible (I can’t speak for the other, but strongly suspect them to be similar). It seems like Mojang opted for decks that provide a solid basis of cards representing the various things you can do with a given faction, rather than focusing the deck on a particular theme (the way I’m used to with Magic preconstructed decks). The good part about this is that once I accrue more cards (a lot more cards) I will have a good basis for deck-building faster. The bad part about this is that the deck has so little internal synergy my first few games boiled down to more luck of the draw than anything else. At first glance, this appears to be a pretty neat card. It only costs one resource (the prominent top number). It has three defense, so provides a nice little barrier between your idols (the back row you have to protect) and your opponent’s low-power creatures. 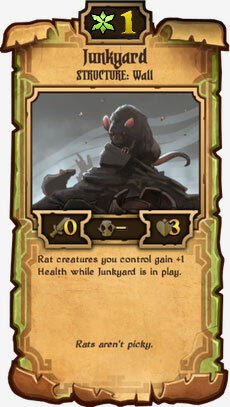 And every rat you play gets an extra health! Sounds like the perfect first-turn play, to me. Similarly, one of the “rare” cards included in the starter is a wolf who gains power based on how many other wolves you have in play, but because there are so many non-wolf cards it’s very difficult to get that synergy working correctly. Taken alone, none of the cards in the starter are bad (I can see a use for most of them, if only I had the cards to support them), but taken together the whole thing plays poorly and with very little synergy. On a given turn, you can discard one of your cards in order to draw two additional cards. However, this is mutually exclusive with sacrificing a card for resources. After you get some creatures onto the battlefield, you have to decide where to move them. Most creatures have a cooldown value of at least two, which means the majority of them will only be attacking every other turn. Additionally, creatures can only move one square per turn. This can lead to some tricky tactical choices; do I spend two turns of movement to position my creature so my opponent can’t take it out on his next turn even if it results in a sub-optimal attack? Or do I chump block with it, and hope that something better comes up? Anticipating your opponent. This is part and parcel of the tactical board play, but being able to predict what your opponent will want to attack is key to setting up your own attacks. Timing (both of cards you play and movement) is very important. I have several times screwed myself up by moving a creature, sacrificing a card to draw two more, and discovering had I done that in the opposite order I would have had a far more optimal play. All of this adds up to solving some of my least favorite parts of Magic: no lack of resources due to bad card draw, no turns where you’re just killing time hoping the one card you draw will make a difference, and no getting stuck with nothing in your hand and no way to refill it. Unfortunately, there is a downside to all those tactical decisions that I love so much, and that is games that last quite a lot longer. Part of this is simply that you’ve got a lot of cards in your deck (50), so as long as one player doesn’t completely neglect to draw cards odds are good you’ll be able to pull something out to thwart at least some of your opponent’s schemes. Additionally, because the game is so tactical, if one player gains a sufficient advantage in cards on the board, the end can be effectively decided long before the third idol falls. The card pool helps alleviate this somewhat by offering several things that can unexpectedly flip the game your way (creatures that attack the turn they come out, low amounts of distributed direct damage, etc. ), but at least so far most of the games I have played have had a very clear winner by the mid-game and destroying the final one or two idols is mostly busywork as the winning player waits for their cooldowns to drop, which makes the game feel even longer. Scrolls is fully asynchronous; on your opponent’s turn, you will spend your time passively watching whatever they decide to do. On yours, they’ll return the favor. This is extremely common in online CCGs, of course (playing Magic online takes forever, for instance, because both players have to be constantly opting out of responses whenever one player does something; in an asynchronous game this is a non-issue). However, it also reduces your investment in the game because if your opponent wants to take forever pondering the many decisions available to them, you might as well go out to coffee in the meantime. Plus so far as I can tell, you can’t participate in anything except real-time matches, and the ability to participate in more leisurely games is about the only main upside to asynchronous play, so far as I am concerned. Of course you’ll notice that it is not possible to “pay to win” since the bulk of your cards will be purchased with gold (unless you can trade shards for gold with other players, which I have not investigated). This is good, because everyone is theoretically on an even playing field where your card collection is based more on how much time you’ve spent on the game than how much disposable income you have. But it is also bad, because it means that as the game gets older, it will be harder and harder for new players to collect a competitive set of cards without spending truly phenomenal amounts of time, either playing matches for gold or engaging in trades. For me, this is a solid black mark against Scrolls because spending a bunch of time and energy trading has never been something I am interested in (not to mention the difficulty in figuring out what cards are worth, which requires up-to-date knowledge of the market and meta). Coming away from my first brush with Scrolls, I get the feeling that this is a game that has been released at the wrong time in my life. I suspect that had it been release when I was younger, I would have loved it to pieces and spent far more time and money obsessing over it than I should. However, as I have grown older, my patience with games that demand huge chunks of my time in order to succeed has dwindled. I dislike arbitrary rarity schemes and the massive investment in time trading that they require to accrue a decent collection. Oddly, although I find Scrolls’ theme to be one of the more unique fantasy worlds I’ve come across in a CCG recently, it ultimately leaves me flat. The idea that a bunch of people are wandering around with a giant collection of magic scrolls on their back just waiting to throw down is even less believable than things like Pokémon (which is saying something). Although the energy faction has some really quirky, interesting creatures, growth and order both feel very ho-hum to me (“wolves, and Vikings, and ducal liegemen…oh my?”). In short, Scrolls demands a large chunk of my time, but the payout simply does not seem worth it. I will probably continue to try it on and off, and keep a general eye on its development, but at the moment it feels like something to idle away the time while I wait for Hearthstone or one of the other upcoming digital CCGs to fill the hole in my life left by Magic. You should take a look at “HEX”, this is a new digital TCG who happened to just finished its kickstarter campaign. Seems to be a solid online TCG, you should have a look if you like this kind of game. I have absolutely zero interest in Hex (saw it when it was first released). Their video was like they took all my least favorite buzzwords from MMOs, combined them with all my least favorite buzzwords from TCGs, and then threw in a bunch of jokes about killing people in extremely poor taste. Clearly that’s of interest to some folks (given the level of funding it received), but it left me cold. Just saw Scrolls this morning before work for the first time (TotalBiscuit was playing it) and before I knew it I owned it. Are you sure you even like CCG/TCG games? Based on everything you said, it seems like you have completely drifted away from the genre that you USED TO love immensely. Maybe it’s time to just start looking at other genres more seriously? Wow, I am so out of touch with myself that I completely failed to realize my dislike of a single game meant that I *actually* dislike the entire genre! All the other CCG games that I’ve loved throughout the years (Magic, Star Chamber, Legends of Norrath, etc.) must have been flukes. Thank you for opening my eyes. I shall immediately go and try online poker instead. I’ll probably have to stop playing first person shooters, too, since I disliked the last couple Call of Duty games. Reading the comments section you kind of come across as a jerk tbh. Don’t know if your looking for that kind of feedback. Just sayin, don’t think its helping your cause. I reserve my right to sarcasm toward people who write inane things about me on my own blog. Plus, I don’t actually care if you think I’m a jerk, Mr. Angry Anonymous Person, since I don’t have a cause. I am perfectly comfortable if people disagree with my conclusions about Scrolls (or Hex, or whatever); the whole point of this post is to share my personal opinions about the game, not tell you The One True Way That Things Are. This was a really great first impressions article, very well done. I also completely agree with you. I too have a hole left by Magic, I keep trying digital online TCG’s from time to time just hoping one can capture that “Magic” again, but they never do. Little things like how Scrolls handled starter decks and the bland art style stood out but the first big thing for me was time. I didn’t find trading fun, just a chore for the same reasons you talked about. Also I found that matches on average just take way too long comparatively for this kind of game. Not to mention how long a close game or stalemate can take. And that leads to my biggest reason, the matches just aren’t interesting or exciting. Most matches are one sided and have been decided already by mid game like you said. A good match is very rare. After spending awhile with the game I can safely say it’s not for me. On a side note I got into Hearthstone not to long ago. It hasn’t been long enough to form anything other than an extended first impression, but that first impression is fantastic. Lower time investment collecting instead of trading, consistently quick and exciting matches, plenty of depth, interesting mechanics, and it’s just plain fun. Hopefully we both find what we’re looking for with Hearthstone. I was lucky enough to get into the Hearthstone closed beta quite early (guess they must not have had many Mac users in their pool or something, since my hardware is pretty run-of-the-mill), and I’ve been loving it, as well. Probably the best Magic-style CCG adaptation to digital that I’ve ever seen (since the simplicity that’s necessary to make a digital CCG flow smoothly doesn’t completely annihilate the strategy and tactical elements), plus the shiny animation factor alone is bound to pull in a ton of players once it’s open to sign up and play for everyone. We’ll see if it has legs long term, but I’m already putting an hour or two into Hearthstone every couple days, whereas Scrolls didn’t last much more than a week of on-and-off play.